Last weekend the Open Dutch Championship 2011 was held on the TT Circuit. On a very sunny Saturday they practised and qualified, determining the starting grids on Sunday. Sunday started a lot gloomier though, in the morning -while warming up- it was simply poring. So far I hadn’t attended any of it; my plan was to go and see the races on Sunday afternoon, but with weather like that I was having second thoughts. This weekend the Superbike races are held at the TT-Circuit of Assen and then there are 2 days of practice and qualifying that precede it. I went to see the Friday free practice sessions. Early in March, at the end of the Ice-skating season the track is handed over to those daredevils on motorbikes and tires with huge spikes and the Ice-Speedway truly finishes of the track in the days to come. Yesterday was a great day, lots of sun and not too cold. The start of spring? It’s about time and it was a great day to go outside and take some photos. Panorama photos that is. Wednesday evening June 23 the ‘TT Festival’ began in Assen. Three evenings of fun, fair and music to entertain the masses that are attending the TT Races on Saturday and the training and qualifying sessions before that. Wednesday was dubbed Soul Night and they had three national soul acts on the main stage. The first was local singer Roan whom I did not see. The next two artists were more up my alley. 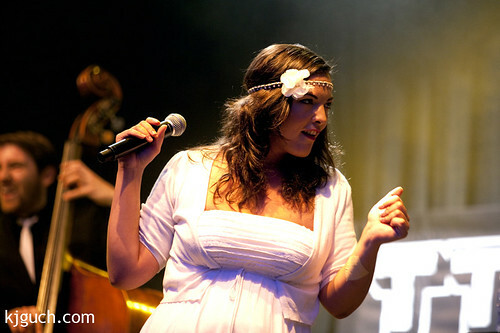 The second act of the evening was Caro Emerald with band. They play a mix of ballroom jazz, mambo and a bit of jump’n’jive. Swinging, joyful summer music. 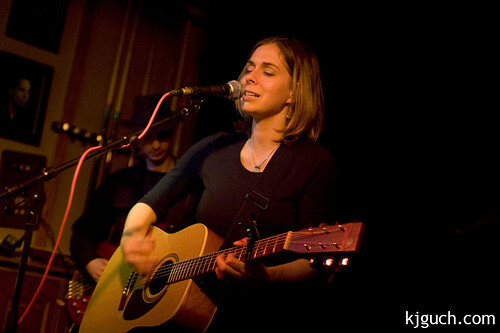 Caro’s name is rising quickly in the scene with the album ‘Deleted scenes from the cutting room floor’ doing very well. Internationally her star is also rising when her version of Lady Gaga’s ‘Bad Romance’ was discovered in America. The was a large crowd on the ‘Koopmansplein’ where the main stage was set and the mood was very good. The band played a great and cheery set (any band including a piece of Ennio Morricone filmscore in their live act is a good band in my books), all the hits and singles were played and of course as an encore ‘Bad Romance‘ just had to be played and was received incredibly well by the audience. Fantastic gig. After Caro’s encore the stage had to be rebuilt for the next act and the audience was entertained by a DJ set playing some goldies oldies that underwent a dancebeat update and some popular singalongs. 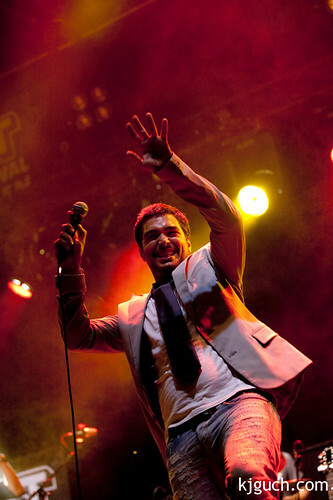 But a quarter to twelve it was time for the next act: Waylon, a Dutch soul-singer who participated in ‘Holland’s Got Talent’ (finished in second place) and eventually got signed to Motown. He has a great band with him and though the music isn’t really up my alley, I must say I was impressed. He has a great voice and won the audience over easily. In preparation of the races on the TT Circuit of Assen on Sunday May 16, the Superleague Formula held Qualifying sessions and knockout finals on Saturday May 15. A day earlier there were already some practice sessions and a demonstration in the town center of Assen that was well attended. Photographing these cars (or any for that matter) is a lot different then photographing motorcycles. Motorcycles are a lot more dynamic in corners as to cars. Also the cars a bigger and getting them interestingly on a photo is not that easy. It might work better if you shoot them from the front, but there were lots of gates preventing decent shots from that point. Luckily we were able to get on the top op the hospitality house so I could shoot some cars a little more from above and vary the shots a bit more. I’d like to try again sometime, but I’d like some different angles to shoot from. But it was great to see these racemonsters racing over the circuit near my hometown. The noise these car make is insane. The last event I saw was the Dutch Supercar Challenge race. Roaring engines, air-tunnel designed cars and as pit-stops were mandatory, so standing above the pitlane was a fun place to be. Didn’t get many racing images and certainly not many interesting ones, but a view from the pit is -for a change- quite interesting. On May 5 we (the Dutch) celebrate our liberation here in the Netherlands. On this day 65 years ago WWII ended for us, though nowadays we celebrate liberation in a broader concept. Part of this celebration is music festivals all over the country with some interesting and well attended versions in Groningen and Zwolle. However as I had other work to do today, I chose to visit the one in my town: Assen. This version is somewhat smaller then it’s neighbours, but three names on the bill were very interesting: Krause, Jelle Paulusma and Sandy Dane. Unfortunately Krause had been cancelled. Apparently the organization had mistaken her for a DJ instead of the electro/discobeats band that she is. So the cancelled her and the chance to finally see her perform live was shortlived. The other two names however were still on the bill. After some shots during the Supersport and the Parkingo Series I eventually settled on the hill in the ‘Strubben’ corner. It’s an interesting corner not to far from the start/finish line. You see the racers in a fairly slow set of corners, enabling the daring racers to make a move. It already delivered me shots of a crash during the first lap when all racers were still huddled together, fighting for some room on the track (and preferably before the others, thank you very much). This race was a lot more exciting to watch than the first as there were more groups of racers instead of racers racing separately. All in all I was able to get some more interesting photos and I enjoyed the race a lot. Unfortunately my beloved Ducati’s were mainly guarding the rear this time, Jonathan Rea of the Hannspree Ten Kate Honda team (bike number 65) dominated both races. While in the GT corner, I also shoot a free-hand panorama of the GT Tribune and the main tribune. Some errors in the tires in front but a nice shot just the same, I think. The opening of the track season at the TT-Circuit of Assen was nearly here and I was a little worried as the past few days as the weather wasn’t very good. To be honest, it’s been pouring. But whatever the weather, on Monday the 5th of April with the Paasraces (Easter Races) the season would be opened. Thanks to the rain I skipped the training session on Saturday, but I really wanted to attend the races on Monday. Luckily the day started bright and sunny. The afternoon brought clouds, a little rain and lots of cold wind, but it was a lot better then in had been the past days. After a morning training session the races started at quarter to one in the afternoon. They’d start with the sidecars, the the Supermono and after that the classics. These races were fun to watch, but offered little action. The sidecars were way too much spread over the track to offer any suspense. I guess the Classics didn’t want to chance damaging the old bikes. Once the 125cc class entered the track, with a fuller grid, it started to get exciting. The two Dutch Supersport races and the Dutch Superbike also were lots more interesting to watch with a few crashes, some overtaking and more racing in groups. I tried out various places to shoot photos to avoid getting lots and lots of the same shots and test-shoot some ideas. It was a great practice and I hope I’ll be able to do some more at the end of the month with the Superbike races on their way. Oh, and since I ‘happened’ to have the panorama kit with me, I also took a panorama photo at the start/finish line. It was a bit of a quicky as the riders were awaiting to be let loose on the track, so I didn’t have much time to set it up. Because of that it’s a bit sloppy, there are a few errors (can you spot them? ;)). Currently it’s also available in a Quicktime-version over here. Every year in March the World Championship Ice-Speedway is held in De Bonte Wever (formerly known as DeSmelt). As I wanted to take up some other areas of photography besides concert photography and I do like action shots, what better way then to start here? My dad -a seasoned motor-sports photographer- was also there and will post photos on his site too. I recently posted a blog on my new Nodal Ninja 3 panorama head for my camera gear. However, I hadn’t really found the time to test the device. For those that thought (like me a while ago) that it was mearly a matter of installing the head, hooking up the camera and shoot… well it’s not really like that. Not at all. You need to do some work first to get the right shots. In the past week I read reviews and tutorials, learned about the Nodal point (you set up the panorama head so the lens is rotating around it’s nodal point, this assures seamless stitching of photos) and fount the nodal point for a few of my lenses. I first tried a set of my livingroom and then went in search for the right software. This wasn’t that either. TheCanon Photostich program turned out not to work in Apple Snow Leopard, the freeware software Hugin made photos that looked like they were thought up by Esher of H.R. Giger and not like a panorama at all. Also the Photomerge option of Photoshop didn’t work at all, it could not make any decent panorama of the supplied photos. Eventually I found PTGui and that’s just incredible. So now that I had a working setup and the means to produce a panorama, it was time to take the kit outside. I first did a simple walk just outside of Assen and tried a few with my 15mm fisheye and also one with my 50mm lens (different Nodal point, but I remembered what it was). However, I also wanted to try a few with buildings, so I headed to the center of Assen and shot some over there. There are a few afterthoughts… I really need another tripod. My Manfrotto 055 is a great tripod, but way to heavy and large to easily carry around. Also a remote trigger would be better to make sure I don’t shake the camera when taking the photos. oh… and I had just thought that a macro lens in combination with a panorama head when I found the settings for the 100mm Canon macro lens with the Nodal Ninja set. So don’t be surprised if that lens is added to my collection at some point this year ;) All in all I’m very happy that the Nodal Ninja 3 works so well and I can’t wait for the summer to come and to find some wonderful locations to make more panoramas.